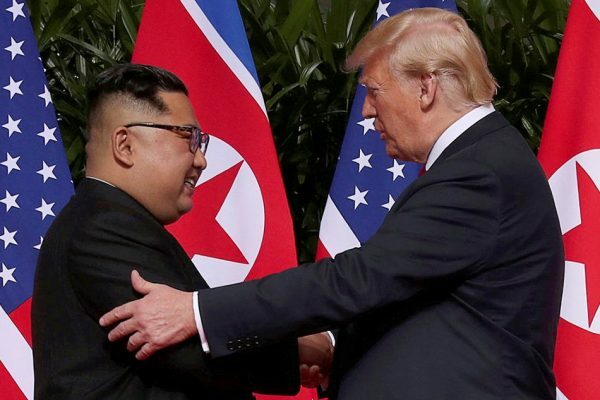 U.S. President Donald Trump said he had forged a “good relationship” with North Korean leader Kim Jong Un at the start of a historic summit in Singapore on Tuesday, as the two men sought ways to end a nuclear standoff on the Korean peninsula. Kim said the meeting was “a good prelude to peace”, but there was no immediate word on any substantive progress in their discussions. But, with cameras of the world’s press trained on them, they displayed an initial atmosphere of bonhomie as they met. After the meetings, the two teams met for a working lunch, where beef short ribs, sweet and sour pork and “Daegu Jormin”, or Korean braised cod, were served for the main course, according to the menu. That was to be followed by dark chocolate tarts, pastries and vanilla ice cream for dessert. Pompeo said earlier the summit should set the framework for “the hard work that will follow”, insisting that North Korea had to move toward complete, verifiable and irreversible denuclearization. Trump spoke to Moon and Japan’s Prime Minister Shinzo Abe, both key allies of Washington in the region, to discuss developments ahead of the summit. Reporters are in a room that has a desk and two chairs flanked by US and North Korean flags, waiting for Trump and Kim to emerge. Julian Borger says it is all in the detail though: there are two pens inscribed in gold and the inscription appears to be Trump’s signature. After a working lunch concluded a morning of negotiations in Singapore, the US president said a lot of progress had been made as they tried to “solve” the Korean Peninsula stand-off. Asked about the discussions, he said: “A really fantastic meeting – a lot of progress. Better than anybody could have expected. Top of the line. The US president said his one-on-one meeting with the North Korean leader, which lasted around 40 minutes, was “very good” and predicted “tremendous success”. The comments came after the two leaders shared a 12-second handshake as they met for the first time in front of a dozen American and North Korean flags. Mr Trump patted Kim on the arm and shared some words before the pair turned and posed for the cameras in Singapore. The body language was surprisingly warm, with the pair at times smiling and laughing as they walked along a collonade towards their meeting. Never before have a sitting North Korean and American leader met. The summit took place at a luxury hotel on Sentosa Island, just off the Singaporean coast. Before their talks – which they held alone except for interpreters – both men expressed optimism about the summit. The sight of the two men sitting side-by-side encapsulated a remarkable turnaround in the pair’s relationship, given they were trading insults and threats last year. It is not known what exactly the pair discussed during their one-on-one meeting, though North Korea’s denuclearisation was on the agenda. President Trump and North Korean leader Kim Jong Un signed an unspecified document that Mr. Trump described as “important” and “comprehensive,” to conclude their meetings in Singapore. But it’s unclear yet exactly what that means. A press conference is scheduled for 4 p.m. local time in which more details will come forward. As they began, Mr. Trump said he thinks he and Kim will have a “terrific relationship,” and Kim, through a translator, said North Korea had to overcome a number of “obstacles” to get to this moment. The stakes are high — the U.S. seeks nothing less than the complete and verifiable denuclearization of the Korean peninsula, and Kim wants to see the sanctions on the North eased. The White House has yet to officially release the document, but show-up photos of the document reveal some of its contents. Mr. Trump, speaking to reporters briefly, was asked what surprised him most about Kim. “Great personality and very smart — good combination,” the president responded. Mr. Trump also declared Kim a very worth negotiator. “I learned that he’s a very talented man. I also learned that he loves his country very much,” he said. This summit isn’t the last, said Mr. Trump who said he expects to meet with Kim “many” times. Asked if North Korea agreed to denuclearize, Mr. Trump said they would be starting that process quickly. It is refreshing that Beijing has applauded the summit between US President Donald Trump and North Korean leader Kim Jong-un, calling it historic. However it is still hard to believe that it’s really happening.